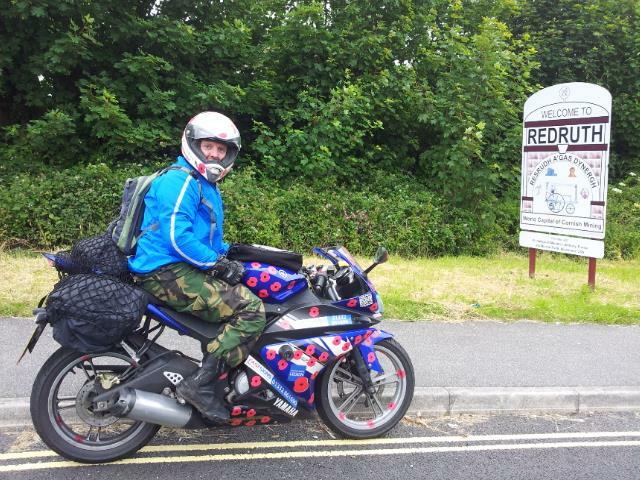 At 5.30am on Saturday I set off on a challenge to cover 1000 miles in under 24hours on my Yamaha YZF-R125 to raise money for the 2012 Poppy Appeal. 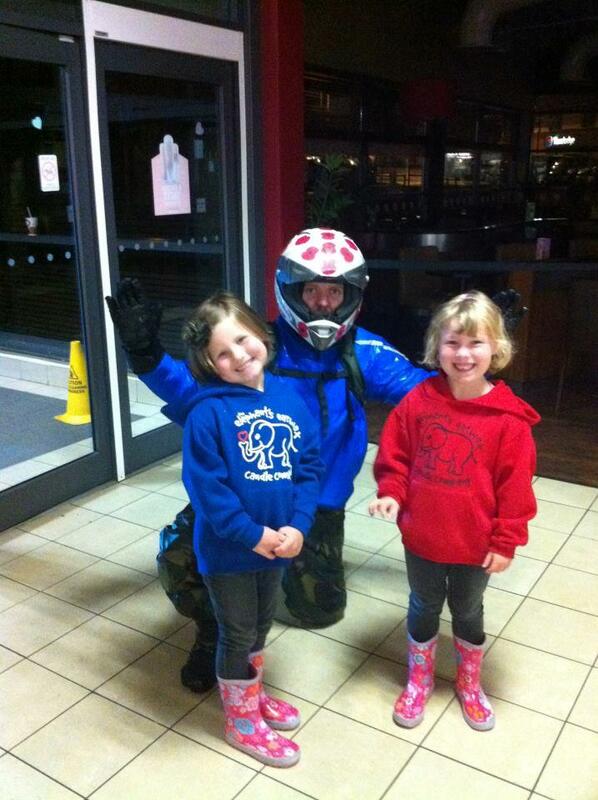 The night before my stickers arrived from Fast Signs in Derby and the girls had fun sticking all the poppies on the fairings and my helmet while I did my final prep. I set off heading north and arrived at Squires cafe a bit late for the briefing and almost missed last orders for hot food. I got a lot of; “so you’re the one doing it on a 125? !” type remarks as my choice of bike caused a bit of a stir. I erected my tent in the rain then headed out to fuel up ready for the morning start. I managed to get lost following a drunk's directions to the next (imaginary) petrol station, when the one I spotted on my way in closed at 10pm. Eventually I fuelled up at Ferrybridge and set off to find Squires in the dark. I spotted a flashing light up ahead in the pitch black giving the morse code for SOS. I took a good Samaritan detour to find a pair of American motorcyclists stuck by the side of the road. No casualties, mechanical failure and “double A” had been called so I wished them luck and returned to the campsite and the nocturnal harmonies of 100 snoring bikers. I Slept through my three alarms and was politely woken by Ladyboy Chris, the rumble of over 100,000cc’s of big bore bikes warming up for the off and Squires’ resident guard dog going berserk. I quickly got dressed and did a final kit check and prep before getting a banana and some water down my neck before lining up with the others for the go. At 05:20 we give a thumbs up, throttle on, visor down and go for it. M62 road works mean a 50mph limit which hurts progress but not as much as the weather conditions. Side winds keep shoving me towards the next lane and the head winds are so strong that I have to pull over as it feels like I’m riding on two flat tyres. Satisfied that it’s not the tyres I hide on the leeward side of a truck for the highest parts of the Trans-Pennine way and make up some time on the misty downhill sections and hit the first check point only four minutes behind schedule. I pulled in to Birch to more “we heard there was a 125 trying this” type remarks and a couple of photos. The marshals cheered me up by saying that the bigger boys are only a few minutes ahead of me. No need for fuel yet so just a signature, a sip from the camel pack, reset the satnav and off again. Traffic is minimal and the wind behind me so I'm able to keep the speed up. I manage to claw back 18mins putting me 16mins ahead of schedule. I celebrate by having an extra couple of minutes break to neck a cob and some more water. Crossing the raised M5/M6 motorway sections near Birmingham was a bit hairy, the side winds up there were demanding constant course adjustments to keep within tightening white lines. I hit a huge tail back on the M5 near Bristol and the little bike played its trump card filtering through all of the cars and vans that had overtaken me over the past hour or so. I even passed one of the big boys, his big sports tourer unable to make the gaps. I keep the pace up and soon pass the congestion and have just open road ahead. The sun has even made an appearance and I start really enjoying the ride. Although theoretically the bike could just about get to Redruth on 1 tank I pull in at Gordano for a quick splash for peace of mind and top tyre pressures up as the temps are cooler than I had predicted. I chat to a Harley V-Rod rider and get back on it for ‘Ruth. Riding through Cornwall and Dorset was one of my favourite sections of the ride, beautiful roads, rolling scenery and every vehicle seems to have surfboards on the roof and passengers with their bare feet on the dashboard. I am definitely coming back here to do some riding. Passed a field of poppies in bloom which reminded me why I’m here and doing what I’m doing. I offer a little prayer then crack on with the ride. Touchdown in Redruth at the psychological halfway point (as it’s the farthest away from Leeds) and the weather is glorious - I even consider taking off the water proofs but think better of it. The locals are friendly and the bike draws gazes and thumbs up all round. Another RBLR chap riding a 1200 Triumph pulls in with a “I saw there was a 125 trying this” and we chat while we eat. I saddle up again for retracing my steps to the M5 and hang right to head east to meet my friend Luke at Stone Henge. Passing a bunch of wind turbines, a third of them brokenly still despite the others spinning, dents my confidence in renewable energies. 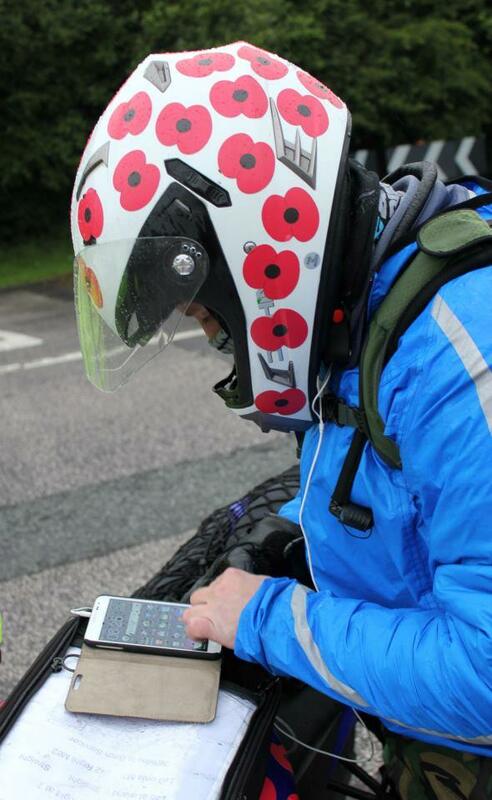 The sat nav stops feeding me audio instructions so I rely on my route notes on the tank bag. Get a bit lost and assume the booms, smoke and Chinooks with fast-ropers are Salisbury (playground of the Air Corp, mechanised and Lobbers) to find it was some Yokel-vil-ton Air show. Will keep my eyes out for it next year as nap of the earth Apaches strafing grandstands of women and children looked well worth the trip. I eventually pick up signs for Stone Henge and meet Luke there. 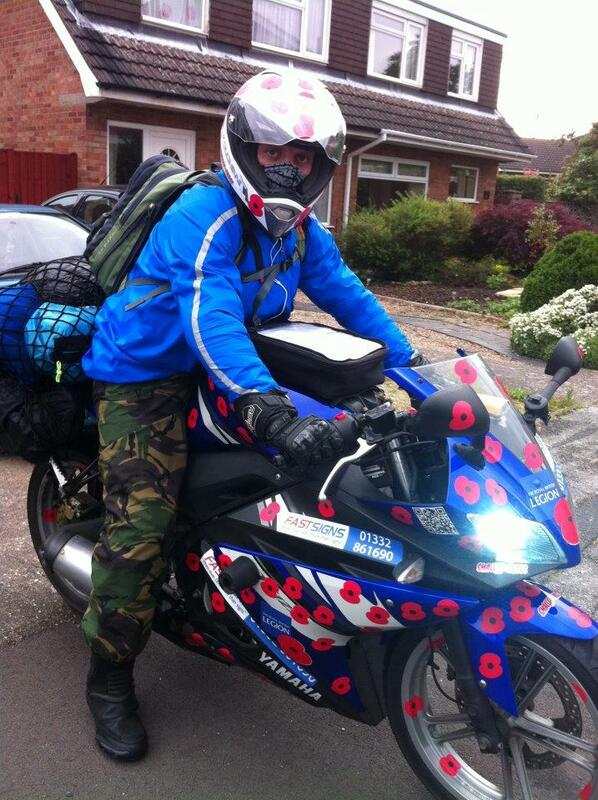 His folks thought I was so daft doing the ride on a 125 that they pitched in a donation too. Luke played Salisbury/Southampton Sherpa and guided me down his little country roads and through towns before waving me in the direction of the M27. Without him I could have easily lost another hour and jeopardised my 24hour target. Pulled into the M27 Southampton services at the half way point of 12hours passed, 160miles ahead of schedule. That felt good. Discovered that the GPS sat nav I had been relying on for audio instructions has given up due to poor coverage and even poorer charging. It was using slightly more juice than the charger was supplying it with. The M roads to Dover were the most boring of the route but passed quickly. Last light overlooking the port of Dover was the highlight. The Dover stop felt a bit odd. My Grandad is currently in a Reims Hospital over the channel as a result of a motorbike accident a couple of weeks back. I knew from my preparation that I was now stood 215 miles from him and 216 miles from my family up in Derby. I had a couple of minutes of feeling quite small and alone. I got back to the task in hand. Powered up the phone and had just enough juice to send a text to Zo to meet me at Trowel services on the M1, eta 4hours and update twitter. Phone powered off and was not responding to charge. That’s the end of the SatNav and contacting the outside world then. I got some more water and an oat bar down my neck and checked the oil on the bike. It was black and thin so I dropped the oil out and refilled it with fresh that I had bought with me. Being a regular commuter and doing all my own spannering means it’s only a 6minute job. 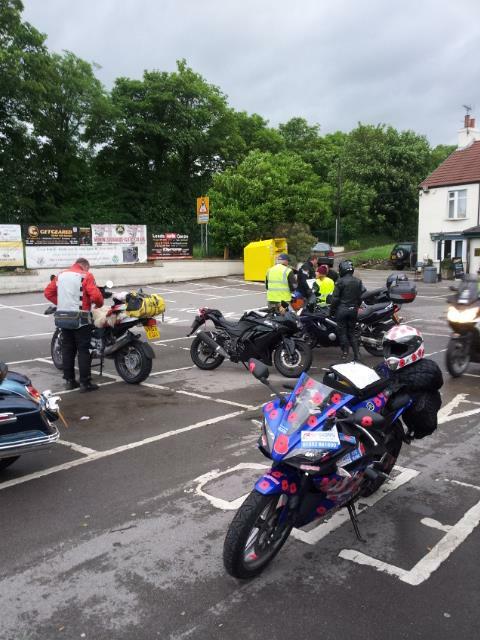 Just as I am about to head off for the last leg the 1200 Triumph bloke pulls in with a couple of others. I had assumed he was well in front of me so seeing that I was keeping pace with the big boys cheered me up. We got a photo and then I left them to it as I headed back north. Passing Brands Hatch I consider dropping in on the guys at TGR Motorsport but as weather is drawing in I decide to pass and keep going instead. Approaching the M25 the rain started, and I mean really started. It was bouncing off the tarmac and the light, fast traffic was slowing down to a crawl. By the Dartford tunnel it was at a standstill so I did a bit more skinny filtering. Just starting to get back up to pace when the traffic matrixes informed me that the M1 route I was banking on taking was closed due to flooding and no alternative was offered. Options are St Albans and try to find my way to the M1 from there without satnav or go for the M40 and pick up my commuting route from Warwick J12 back up to Derby and my M1 RV point. I had to decide and opted for the known quantity of the M40 despite knowing that it was a massive dog leg and would add a lot of miles and a lot of time to the ride (in hind sight 60miles and 70mins extra). I now had the additional pressure and panic of having just committed to meeting the Mrs in 4hours to now having a 5hour ride ahead of me knowing that she would be worrying for a hour with no way for me to be able to get in touch. I would just have to get my chin on the tank and go for it. The rain is coming down in sheets; reduced visibility, no street lights, lane changing side winds and peoples' driving is becoming atrociously bad, with cars overtaking and then pulling directly in front of me despite the otherwise empty roads! I stick myself in plain view in the middle lane while hugging the tank as the rain gradually beats its way past my waterproof and chills my skin. I begin to feel the weight of the task ahead and my blinks become slower and more laboured. I thought I had crashed. That’s how violently the rumble strips at the side of the road had thrown me and my little bike around and woken me up. My visor had fogged over and I had obviously fallen asleep. Flipping the visor up to get some fresh air I realise that I had wandered from the middle lane to the left lane and on to the strips. The next services were in two miles and the adrenaline and the pounding in my chest caused by the near off would easily get me there. Stopping for coffee and a rest did me the power of good. Two guys in a Lupo came over to see if I was ok. They said that I was riding quite slowly so they hung back behind me to see if I was ok, I drifted onto the white line and then shot off into the services. I thanked them and they carried on their way, top lads. I carried on north passing my home town and it was so tempting just to pull in to my village and curl up in my own bed. 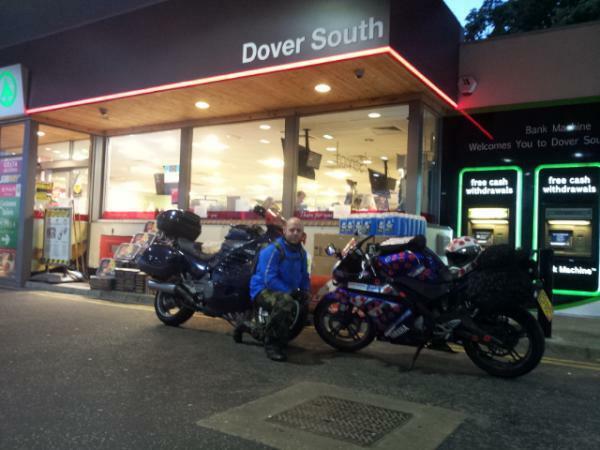 The massive detour, slow riding conditions due to poor visibility and slippery roads plus the forced break meant that the 4hour leg from Dover ended up taking over 6hours. At some point on the M25 the clock I had stuck to the dash had fallen off so I had no idea how far behind I was now and was certain that I had failed to meet the 24hour deadline. I pulled in to trowel services and was met by the three biggest smiles in the world and (because I was soaked to the skin) reluctant cuddles. Zo and the girls had waited for me and I couldn’t wait to see them. I don’t know who was more relieved to see the other. Zo told me that I was still within reach of hitting Squires in under 24hours and volunteered to guide me the last 65miles. I followed her tail lights and only let off when I saw the glow of Squires in the middle distance. 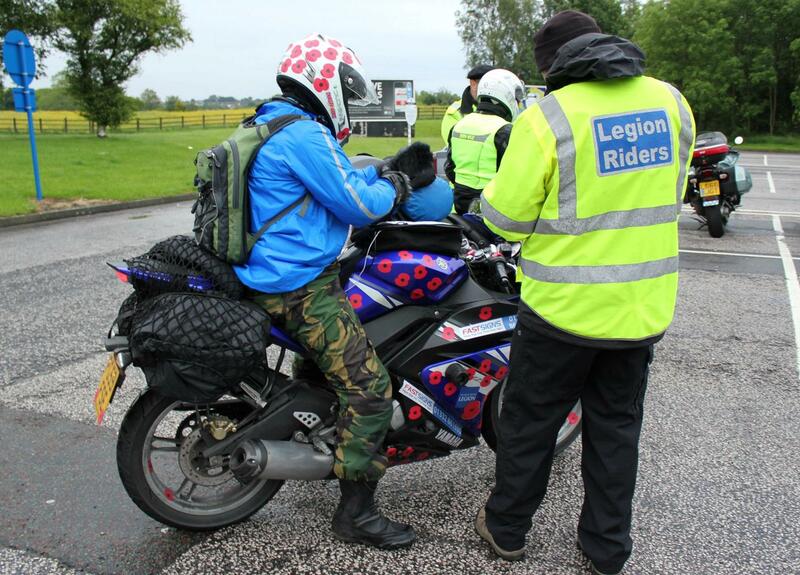 I pulled into Squires soaked, cold and knackered to cheers and applause from the marshals and other riders that had already arrived and instantly felt like a superstar. Pats on the back and lots of “well done” were metered with “you're still nuts for trying on a 125”. One bloke (Steve I think) even donated to my total despite having just done the ride himself! I managed to complete the challenge ahead of a number of the bigger boys on dedicated touring machines. And that felt really good. Thank you Zo and the girls for losing a lot of me during the preparation for this event, and for waiting for me at Trowel. The Derby branch of www.FASTSIGNS.co.uk for the fantastic bike graphics. Luke “Tonto” Hill for guiding me through the wilds of Wiltshire. My Aeroacoustics team at Jaguar Land Rover for hearing about nothing but this for the last weeks, and for their generous sponsorship. TGR Motorsport for their endless support and advice. The guys at www.SMALLEYCROSS.co.uk bikes and scooters for your backing and support. Everyone else who has sponsored me and given support and encouragement.